Looking for St. Croix beaches? You’ll find many gorgeous beaches to choose from. Most have very few people except on weekends when the locals arrive to relax, swim and have cookouts. Some have palm trees for shade and other will require you to load up on sunscreen. All St. Croix beaches are supposed to be available to the public but some resorts make it difficult. The only beach that’s closed part of the year is Sandy Point Beach for turtle nesting. Lovely beach at the Buccaneer resort hotel, three in a row. Turtle Beach is on Buck Island which was declared a national Monument by President Kennedy. It is considered one of the most beautiful beaches in the entire Caribbean. You can access this beach by taking one of the many charter boats that visit the island each day. Under-water snorkeling trail. Beautiful sandy beach with spectacular views of Hamm’s Bluff, shade, snorkeling and world class diving on the reefs and walls close to shore. Cane Bay Dive center, Cane Bay Beach Bar & Grill, Off the Wall Beach Bar & Grill, and Sprat Net Bar. 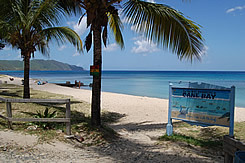 Davis Bay or Carambola Beach. Picture postcard perfect. Restaurant, bar and dive shop. Good waves. Swim at far end. Good sandy beach at Cheney Bay Beach Resort. Some grass on bottom. Restaurant and bar, hammocks, beach chairs and kayak rentals. Long and beautiful beach at Coakley Bay Resort. Sandy beach with reef and excellent snorkeling. Located at Colony Cove Beach Resort. Historic site of the landing of the Columbus at Salt River. Public. Sandy beach, restaurant and bar, water-sports center. Beautiful and sandy public beach, calm waters. Picnic facilities. Located at the Carambola Resort Hotel. Check in at the guard booth and tell them you are going in for lunch. Beautiful white sand beach in a spectacular setting. Restaurant, bar, dive shop. Located on the North Shore at the Gentle Winds Condominium Resort. Beautiful white sand beach. On the south eastern shore of St. Croix close to the Divi casino. Beautiful white sand beach. Can sometimes be a little rough. Nice beach, usually calm water. Some sea grass in spots. Picturesque long beach. Sandy beach, snorkeling. Watch out for undertow in rough seas. Restaurant and bar. Jack’s Bay is remote but beautiful and secluded. East end. Nice beach with view of Christiansted. Parasailing, wind surfers, wave-runners, snorkeling, restaurant, bar. Across from Christiansted by water taxi. Spectacular sandy beach. Beach restaurant and bar. One mile north of Frederiksted. At Teague Bay. Duggan’s Reef restaurant and bar. Secluded beach established primarily to protect the nesting grounds of endangered leatherback turtles. Was in Shawshank Redemption film. One of the longest stretches of sandy beaches in the Caribbean at over 2 miles long. Open weekends only. No facilities. A long stretch of sand one mile long. Beach restaurant and bar. Beautiful powder white sand beach. Calm water, sea grass on the bottom.